The most useful therapy is one that can be applied to a wide range of client problems, is easy to learn, and produces lasting results following a brief intervention. The cognitive-behavioural approaches described in this volume probably come nearest to this ideal. Originally published in 1989, this book begins with a description of the cognitive-behavioural revolution that had taken place in the decade prior to publication and provides therapists with the specifics of helping in four major areas: child behaviour problems, emotional disorders (depression and anxiety), interpersonal problems and addictive disorders. Coverage of the major areas of concern begins in each case with an overview of theory and research in the specific domain, followed by detailed guidance for practice. The volume represents a synthesis of the author’s research and practice with patients in inner city Liverpool and with employees referred by major employers. 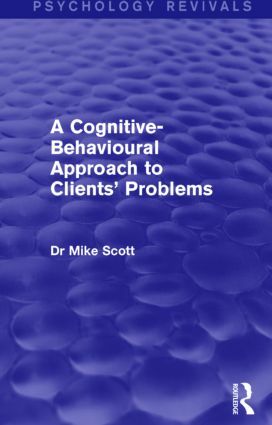 The strategies described have been devised to take account of a wide variety of client social contexts and service delivery settings, and the strengths, pitfalls and practicalities of group cognitive-behavioural approaches are also discussed. The reader is finally led into largely uncharted waters, the application of cognitive-behavioural approaches to schizophrenia, people with learning difficulties and the elderly. Back in print, this title will still be of interest to students and practitioners in social work, clinical psychology, and community psychiatry. Introduction: Behaviourism and Beyond Part 1: A Cognitive-Behavioural Approach to Child Behaviour Problems 1. Child Behaviour Problems: Theory and Assessment 2. A Behavioural Parent Training Programme 3. Parental Anger Control and Communication Training 4. Direct Work With Children Part 2: A Cognitive-Behavioural Approach to Emotional Disorders 5. Emotional Disorders: Theory and Assessment 6. Cognitive Therapy for Depression 7. Cognitive Therapy for Anxiety and Agoraphobia Part 3: A Cognitive-Behavioural Approach to Interpersonal Problems 8. Interpersonal Problems: Theory and Assessment 9. In Marital Therapy 10. Social Skills Part 4: A Cognitive-Behavioural Approach to Disorders of Self-Regulation 11. Self-regulatory Disorders: Theory and Assessment 12. Motivation 13. New Habits for Old Part 5: New Pastures 14. New Horizons in Cognitive-Behaviour Therapy. Appendices. References. Name Index. Subject Index.